In the past I’ve told you about the ceramic Moors’ heads and a Palermitano legend behind these. 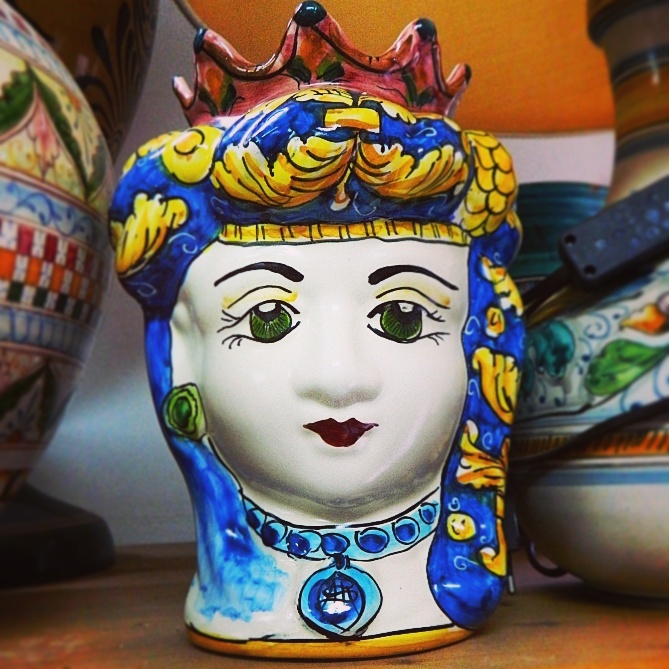 Alternatively, here’s an example of a queen’s head; this one from Santa Stefano di Camastra, a town on Sicily’s north coast well-known for its ceramic artisans and designs. What I’ve learned on my recent trips to Sicily, is that there are two other legends regarding the Moor’s decapitated head and why it became a popular character for a planter; however, I have yet to learn details about why there are also kings and queens’ heads as ceramic vases. My research reveals that these ceramic characters have existed since Norman times and that there is one story involving a princess and a Moor who fell in love and disapproving king and queen parents. When I’m in Santa Stefano di Camastra in on Day 10 or our September/October Enchanting Sicily tour, I’ll have to find out the details of this legend. You can be one of the first to learn it too … We still have a couple of spots left on this phenomenal, small-group tour! Next Post What Swine is It?